It's Real: MY SISTERLOCK IDOL! This is how it all began. 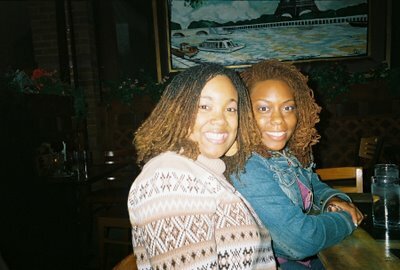 We had just met in Summer '03 in our Master's program. We instantly bonded and became good friends. I would just stare at her hair and imagine me rocking that same style. I was rocking the straight and layered look. 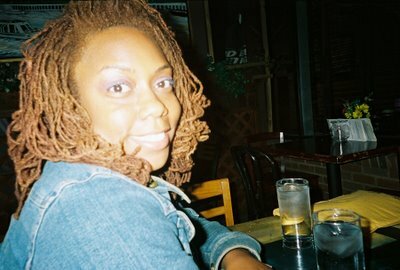 I loved my hair in that particular style but it was too much to manage...especially in Hotlanta. On the hot and humid days it would just curl up and look like a big puff ball. So as time progressed I finally decided that I had to make a change to my hair. I was tired of being a slave to the pressing comb! I decided to get the Sisterlocks! So at the end of July 2004 I went for two consultations and in August it was a done deal. It was one of the best decisions I could have ever made and I owe it all to my friend, LaMonica. Girl, you wear them well and you are my Sisterlock Idol! -ps. i have if its okay added your blog to mine please feel free to reference mine also. Beautiful locks indeed. The picture of the two of you together really shows the beauty of the SL locking method. -Feel free to add my blog to your site and as soon as I take a moment to learn how I will add you to mine. Soror, I just found out about your blog. Your locks look SOOOOO GOOOOOD. You're well on your way to becoming a loc icon yourself. Forgive me for hatin' you and LaMonica for having all of that THICK hair. Even at 4.5 yrs, my locs are not even close to that thick and never will be. Seriously, you both look lovely!! I have to say that both of you guys look marvelous. You and LaMonica have some of the most beautiful Sisterlocks there are!! What month are you exactly?? So happy you are bloggin'. Come to . I will be 2 years in August. This picture was taken a couple of months ago. Thanks!!! you guys look breath-taking. Your hair color really goes well with your skin tone. Fabulous!